Engineers are a practical thinking bunch. When they encounter a problem, they think of it as a challenge that has to be solved by utilizing the mighty forces of applied science. The engineers that make up the management of the leading German wind turbine manufacturer Enercon encountered such a challange a few years ago. Every time they had to ship wind turbine parts across the oceans to provide their customers with clean energy solutions, they faced the problem of standardized cargo units not matching the dimensions of their products at all. This meant that they had to pay for significantly more cargo space than what was actually required for their wind turbine parts. On top of that, fossil fuel prices are rising continuously, an unstoppable trend that will increase transportation costs for all shipping for the decades to come. However, transportation costs are a part of the entire profitability calculation of any project. Thereby, they also play a significant role in the decision-making process of investors when investors choose a suitable wind turbine for their project. German medium-sized businesses are known for their global export orientation, their long-term business strategies, and their obsession to control as many portions of the value chain as possible. With this mindset, the solution to the “challenge” described above was obvious — in order to make Enercon wind turbines more competitive around the globe, they had to construct and operate their own cargo ships. Every child knows that mankind has sailed across the seven seas with 100% wind-powered ships for centuries. So it’s a no-brainer that a wind turbine maker developing their own cargo ship would want to utilize wind power as a means of propulsion somehow. The engineering challenge was to find a way to adapt the age-old concept of sailing to the requirements of 21st-century cargo shipping. In a nutshell: a modern sailing vessel has to be reliable, it can’t be manpower intensive, and it has to be superior in a meaningful way. To solve this problem, the Enercon engineers embraced the concept of “rotor-ships” developed by the German engineer and inventor Anton Flettner during the early 1920s. Flettner utilized the “Magnus effect” to design an unconventional concept of propulsion for a sailing ship. The “Magnus effect” is the phenomenon whereby a spinning object flying in a fluid creates a whirlpool of fluid around itself, and experiences a force perpendicular to the line of motion. In the case of the rotor-ships, the spinning objects are huge metal cylinders and the “fluid” is the wind. The resulting force was utilized to produce propulsion for the ships. In 1924, the first experimental rotor-ship was built. In February 1925, the “Buckau” made its maiden voyage from Danzig in modern-day Poland across the North Sea to Scotland. The two “Flettner rotors” of the ground-breaking vessel operated without problems even in the stormiest weather conditions and were significantly more efficient than traditional sails. Despite receiving such positive reviews and being an absolute technological success, the idea of “unconventional sailing” was no commercial success and the concept was deemed inefficient compared to conventional fossil-fuel-powered naval vessels. The “rotor-ship” disappeared from the seas in 1933 and Anton Flettner turned his attention to other projects. He would later become a pioneer in aviation engineering and develop the first helicopter ready for serial production, the Fl-282 Kolibri (Hummingbird) built in 1942 for the German military during World War II. More than 80 years after the first rotor-ships successfully set “sail” to travel across the oceans, the paradigms of efficiency have changed. Energy efficency and sustainability are the new benchmarks that increasingly define our understanding of how things have to fulfill their purpose in order to be called efficient. With these benchmarks guiding their design process, Enercon built the first commercial rotor-ship of the 21st century, the “E-Ship 1”. Having more than 20 years of experience in wind power engineering, Enercon designed an aerodynamic hull, a new and efficient propeller for the conventional diesel-electric propulsion, modern Flettner-rotors with automatic control systems, and a special over-sized steering rudder that is required to convert the trajectory of the “sails” into the desired forward motion. Energy efficiency being the guiding principle of the ship’s design, the exhaust fumes of the diesel engines that power the two propellers of the main propulsion don’t go to waste. The hot exhaust fumes power a modern Siemens steam turbine that generates additional electricity. That electricity is used to spin the four Flettner-Rotors, each being 27 meters high and having a diameter of 4 meters. This modern motor sailor design reduces the fuel consumption of this 123-meter-long cargo ship by up to 30-40%. 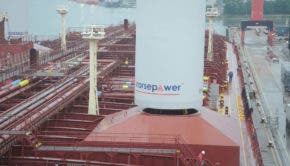 The ship made its first voyage with cargo in August 2010, carrying nine turbines for Castledockrell Wind Farm from Emden to Dublin, Ireland. Today, it regularly ships wind turbines around the world. According to a ship-tracking website, E-Ship 1 just left the Cape Verde Islands off the coast of Africa a few days ago. One more fun fact: this is the first ship to utilize excess heat of the engines to cool the interior of the ship — just a little extra, in case saving 40% on increasingly expensive gas isn’t enough to set new standards. The E-Ship 1 — 21st-century sailing at it’s best!